Barnsley Central MP Eric Illsley has resigned, two days before he is due to be sentenced for dishonestly claiming parliamentary expenses. 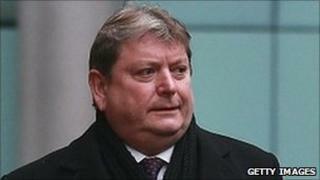 The former Labour MP had come under pressure to step down after admitting £14,000 of expenses fraud last month. Illsley had earlier said he "deeply regretted" his actions and would resign before his sentencing, which is due at Southwark Crown Court on Thursday. A Treasury spokesman confirmed that Illsley had resigned on Tuesday night. The spokesman confirmed that Illsley had been granted the ceremonial post of Crown Steward and Bailiff of the three Chiltern Hundreds of Stoke, Desborough and Burnham - the traditional way of resigning from Parliament. A writ will be moved for a by-election in his Barnsley Central seat, where Illsley enjoyed a majority of over 11,000 at the last election. Illsley was re-elected as a Labour MP last May with a majority of more than 11,000, having first entered Parliament in 1987. But he was suspended by Labour after being charged with abusing his expenses and has since been sitting as an independent MP.